One of the things that we often want in cooking for one (just as in cooking for four or six) is fast and easy, and a technique that can be applied to a number of dishes. I’ve mentioned steam-sauté as a great way to cook vegetables quickly–but here are some other ideas for quick cooking. Melt butter in a covered frying pan. 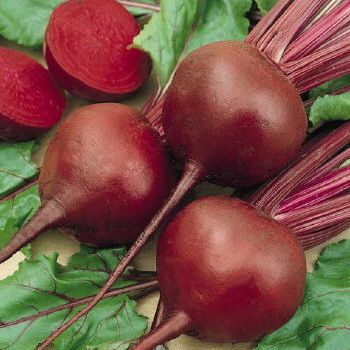 Add beets, and stir to cover with butter or oil. Season with lemon, salt and pepper and serve. Although this will serve four, it’s easy to cut this down to a single-serving size–there’s really nothing to measure or adjust–it’s easy to eyeball the amount of butter and quantity of beets needed. What could be simpler! If you want to get just a bit fancier with your veggies, you could make röstis. This gives you different flavor and texture for very little extra effort. You’ve probably heard of rösti–maybe just as “potato pancakes”. A potato rösti at its simplest is just grated (shredded) potato, mixed with a little flour to help hold the potatoes together (and maybe some Parmigiano-Reggiano), which is sautéed in a little butter until tender, brown, and crispy. It’s simple, quick, and yummy–and even better, it’s easily made for one or two people as it’s really not a fussy recipe: small for a side dish, or a bit larger for a main course. 1/4 cup olive oil, plus extra for greasing pan and your hands. Heat oven to 350° F and grease nonstick muffin tins or backing sheet. Grate the potatoes and onion (food processor, or by hand). Squeeze dry with paper towels. Put in bowl, add Parmesan, flour, and oil (if baking–omit if sautéing). Divide between muffin tins and press down, or press into cakes. Bake or sauté until crisp and golden–about 30 minutes. Obviously, this technique will work well with other vegetables–such as beets, carrots, squash, cabbage. You can see that this is easily cut down for a single serving: you’ll want about one-fourth this amount: 1 tablespoon oil, 6 ounces potato, 1/4 onion, a healthy pinch of rosemary, 2 tablespoons Parmesan, and a scant teaspoon of flour for one large cake, and the cooking time should be about the same since the recipe calls for dividing into cakes. Making these in single serving sizes, I opt to sauté them rather than bake them. I omit the oil from the mixture and add a little to the skillet. This technique can be used with lots of other vegetables–one of the advantages being that the shredded vegetables will cook more quickly than whole veggies. Trim and peel beets as you would potatoes. Toss grated beets in bowl with rosemary, salt and pepper. Scrape beet mixture into skillet, and press with spatula to form a round. With medium to medium-high heat–the pancake should gently sizzle–cook, shaking pan occasionally, until bottom of cake is nicely crisp, 8 to 10 minutes. Slide cake onto a plate, top with another plate, invert the two plates, and return cake to pan. Garnish, cut into wedges, and serve hot or at room temperature. This can be readily adapted to other vegetables–carrots, parsnips, rutabagas, turnips–which have about the same texture and density as beets. Once you’re familiar with the technique, you can use vegetables with different textures: summer squash–just squeeze them thoroughly to remove moisture, and remember that they will cook more quickly than beets.